Indian Premier League Franchise Rajasthan Royals opened their new training facility at Reed’s School. Former Rajasthan Royals player and Australian Cricketer Shane Warne was part of the launch. England cricketers Ben Stokes and Jos Buttler currently play for the IPL franchise. Shane Warne was a true innovator on the cricket field and now after retirement it as well as he helped launch the first Indian Premier League academy in the United Kingdom. 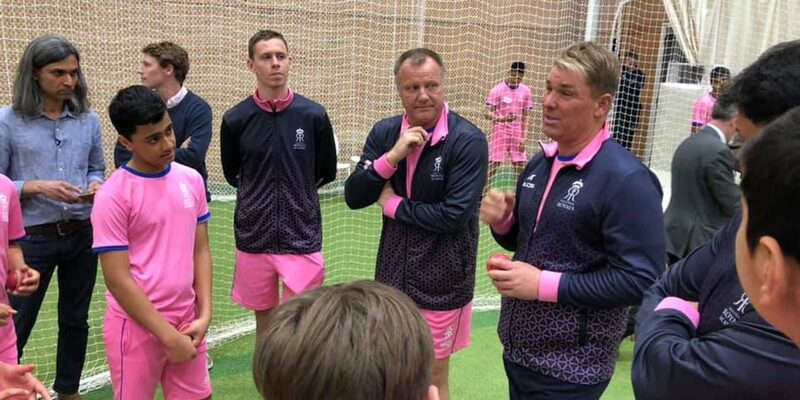 Recently few days back IPL franchise Rajasthan Royals opened their new facility at Reed’s School in Surrey, United Kingdom. It was first known as Star Cricket Academy but is now known as the Rajasthan Royals Academy after recent partnership, with former professional batsman Sid Lahiri as its director. The training centre has a state-of-the-art cricket centre named the Jarrett Centre, RR said in a press release. Former Surrey cricketer Keith Medlycott, who is the cricket professional at Reed’s School, is a mentor at the new venture. Lahiri said: ‘It feels great to be laying the foundations for the future careers of so many cricketers. Meanwhile, Shane Warne believes Australia will welcome back Steve Smith and David Warner with ‘open arms’ when their international bans expire and their inclusion will boost the team’s chances of winning this year’s World Cup. Smith and Warner had been recently suspended for One year for their roles in a ball-tampering scandal in South Africa last year and can return to top-level cricket at the end of the month just before the Cricket World Cup 2019. The franchise said it is also keen to create an exchange programme across India and UK wherein the children from the UK will receive an opportunity to come to India at Institute of Sport, Nagpur.